Chanel’s angular, blackened Boy.Friend, beat out some stiff competition in the Ladies’ category of the Grand Prix d’Horlogerie de Genève on Friday. The watch takes its name from the fashion industry’s pet prefix attached to a shirt, jacket, or some other item that belongs to your boyfriend but which you like to “borrow.” It is usually masculine by design, but tends to look good on women, too. Gender neutral design is a Coco Chanel signature; her boxy tweed jacket and skirt ensembles were famously inspired by men’s suits. The Chanel Boy.Friend watch (CHF 53,900 or approximately $74,000 at current exchange) is a ladies’ watch, but with angular lines and a blackened openworked movement with a matching black strap instead of a bracelet. The diamonds set into the bezel of a pink gold case are the only traditionally feminine touch on the timepiece. Housed inside it Place Vendôme-shaped case is the openworked Calibre 3—the third in-house movement produced by Chanel’s watchmaking division in Switzerland. The circular elements of the vertically aligned movement are beveled at the edges and gold plated to match the case. It is manual wound, with a 55-hour power reserve. Another big winner in the Ladies’ Complication category was the Van Cleef & Arpels Lady Arpels Planétarium, an astronomical complication whose design is closely linked to the men’s Van Cleef & Arpels Midnight Planétarium. 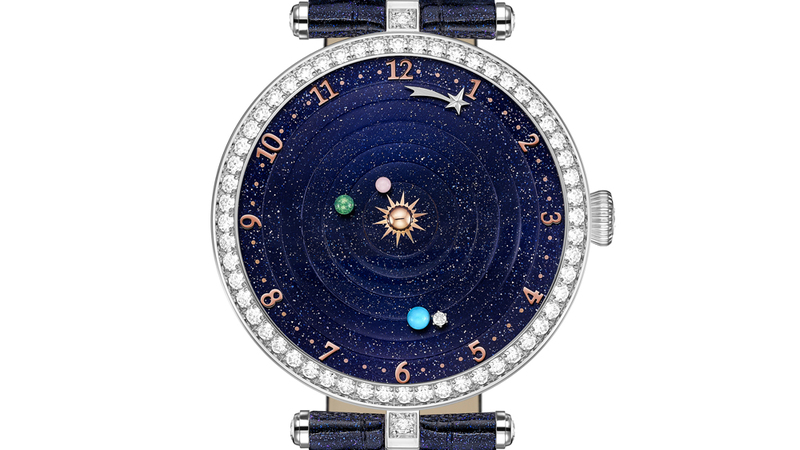 The dial features planets and a moon made of precious gemstones that rotate around a center sun in real time. A gold shooting star is used as the hour marker to indicate the time. It is priced at $340,000 on an alligator strap and $458,000 on a diamond-set bracelet. Van Cleef & Arpels took home another top honor, the Jewellery Watch Prize, for its Secret de Coccinelle (CHF 1,093,000 or $1,504,000 at current exchange), a unique piece in the style of a secret watch. The cover, designed as a lady bug, is set with rubies, diamonds and onyx. 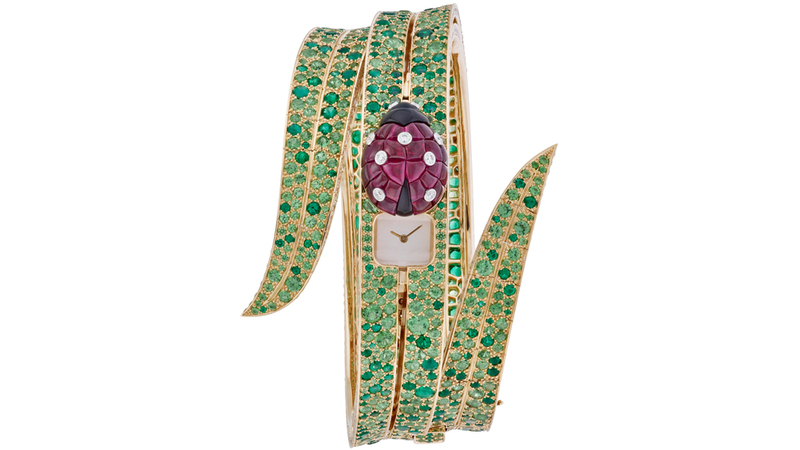 The bracelet, designed as a leaf, is set with green tsavorite garnets and emeralds. Hermès, known for its interesting dial work in its ladies timepieces, took home the award for The Artistic Crafts category. 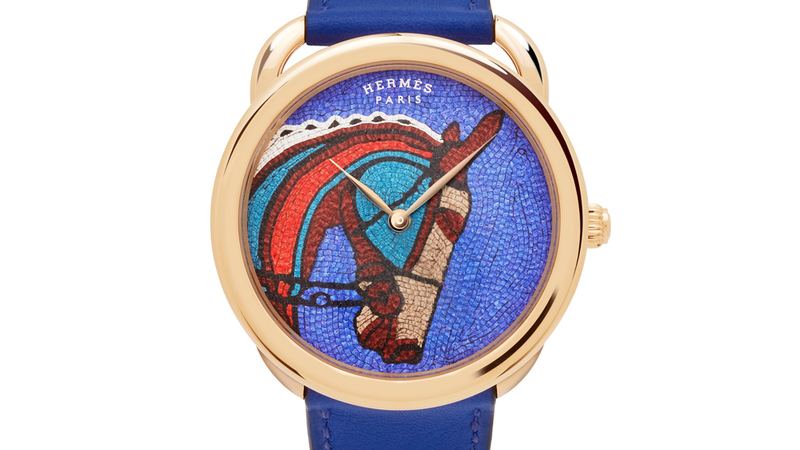 Its Arceau Robe du Soir’s mosaic-style dial is composed of 2200 squares of leather to create a motif inspired by a popular Hermès silk scarf of the same name. It is a 12-piece edition priced at CHF 52,000 ($71,500 at current exchange).